Shorebirds in breeding plumage: an Achilles heel!? I will start by saying that I absolutely love birding. Perhaps what I love most about it is that there is no ceiling to the limit of knowledge one can acquire throughout one’s lifetime. 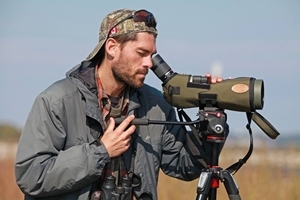 I will forever be a student of bird identification, and this mindset keeps me wide open to receiving feedback; if you’re young and hungry and happen to be reading this…trust me, it’s the way to go as you grow as a birder! I have recently come to realize that I have a new identification weakness: shorebirds in breeding garb. My first recollection of becoming aware of this weakness is of a visit to Hillman Marsh last May. I was standing in the shorebird shelter, chatting with clients, when I overheard a birder, I believe his name is Bill Lamond, talking to a fellow birder while viewing birds through his scope. “Semipalmated Sandpiper.” I traced his trajectory to the bird and centred it in my scope view, thinking “that’s a Semipalm..? Oh, wait, ya ya.” I came to realize that it was my lifer breeding-plumage Semipalmated Sandpiper! Here I was, leading tours for a living and I had very limited experience with breeding-plumage shorebirds. In 2012, every bird was new and IDs were overwhelming while birding in Manitoba for the breeding bird atlas. In 2013, I skipped spring shorebirds and focused on forest birds in prep for a summer job. In 2014, I was hired as a field biologist in the Okanagan Valley and missed spring shorebird season. In 2015, I began to lead tours locally, in Ottawa, where the spring shorebird scene is limited; I recall seeing very few! In 2016, I again lead tours as well as worked retail, having no experience with shorebirds in the spring. In 2017, I had my first real taste of spring shorebirds, birding at Hillman Marsh! Once I left Pelee, that was it; no more shorebirds to study. Fast-forward to 2018, where I had a similar dilemma, albeit by 2018 my base skill set had risen quite a bit (even over my spring 2017 “start point”) so my ID weaknesses gave me less concern. It all began in late March when a client walked up and showed me an image of a shorebird through his viewfinder. “Lesser Yellowlegs, wow, that’s early!” I had failed to note plumage details and instead focused on perceived GISS, etc. The client eBirded his sighting and our regional eBird reviewer caught the mis-ID; it was a Greater Yellowlegs. When I heard-word about the mis-ID, I sat down at my study and took a look at the photo of the bird on my work laptop; indeed it was a Greater! What I couldn’t shake was the fact that I didn’t look for, or discern, plumage details (such as the heavily-barred flanks to a Greater) while looking at the photo in the viewfinder. Show me a blurry photo of a sparrow’s “face” as its buried in cover and I’ll quickly have an answer on the tip of my tongue. It will likely only take a matter of seconds before an impression is hot and ready out of the oven. So, what’s up with this apparent “blind spot” with breeding shorebirds? As strange as this may sound, especially since I am a professional birder, I feel excited at the time of this writing as I embrace the realization that I am still quite green in some areas. I am excited that I get to continue learning alongside clients as I am paid to do what I love to do. Does any of the above information about my apparent weakness with breeding shorebirds change my status as being a “good” birder? Does it make me any less of a guide? Nope. I continue to be careful, I continue to be precise, I continue to study birds carefully, I continue to have a good memory for detail, and I continue to get a little better each year as I continue to gain field experience. Is this denial? Is my confidence shaken, even if only just a bit? Nuh-uh, nadda. Onwards and upwards, like a flock of well-fed migrant Eastern (griseus) Short-billed Dowitchers exiting a lagoon cell!